Now there seems to be evidence for all three of these on Titan. Clark et al. (2010, in press in JGR) are reporting depletions of acetylene at the surface. And it has been long appreciated that there is not as much ethane as expected on the surface of Titan. And now Strobel (2010, in press in Icarus) predicts a strong flux of hydrogen into the surface. This is a still a long way from “evidence of life”. However, it is extremely interesting. “It’s as if you have a hose and you’re squirting hydrogen onto the ground, but it’s disappearing,” says Darrell Strobel, a Cassini interdisciplinary scientist based at Johns Hopkins University in Baltimore, Md., who authored a paper published in the journal Icarus [Popular Science]. Erring on the side of caution, the scientists suggest that life is but one explanation for this chemical oddity. Perhaps some unknown mineral on Titan acts as a catalyst to speed up the reaction of hydrogen and carbon to form methane, and that’s what accounts for the vanishing hydrogen. (Normally, the two wouldn’t combine fast enough under the cold conditions on Titan to account for the anomaly.) That would be pretty cool, though not as much of a jolt as Titanic life. 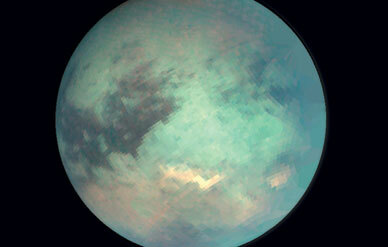 Titan is a monster, the second biggest moon in the solar system at 5150 km (3200 miles) in diameter. If it weren’t orbiting Saturn, it would probably be considered a planet in its own right: it’s bigger than Mercury and Pluto. It has a thick atmosphere, made up of nitrogen, methane, and other molecules. It’s very cold, but it’s known that lakes, probably of liquid methane, exist on the surface. Five years ago, McKay and other scientists pointed out that if methane-based life existed on Titan, it might be detectable through a surface depletion of ethane, hydrogen, and acetylene. New observations show that this is the case; there are lower amounts of these substances than the chemistry of Titan would indicate. Those are the basics. Go read McKay’s article for details. The point he makes is that the results are preliminary, may yet turn out to be wrong, if they’re right may have non-biological explanations, and we should not conclude biology is involved until we get a lot more evidence. As far as the media goes, headlines get eyeballs and sell advertisements, of course. But in cases where the news is like this, news outlets should be particularly careful how they phrase things. They know how the public will react to certain phrases, and the phrase “evidence of life” is substantially less accurate and more likely to incite chatter than “evidence for possible life” — and the Telegraph’s technically accurate but seriously misleading “evidence ‘that alien life exists on Saturn’s moon’” is just asking for trouble. This is the kind of research that easily sets hearts aflutter and space nerds to making high-pitched happy squealing sounds, so let’s knock out one basic thing right off the bat: Nobody has discovered alien life. We have not found E.T. This is only a test of the emergency high-pitched happy squealing system. That said, it probably wouldn’t be remiss to clap your hands delightedly, like a little girl. As I said, nobody has found alien life, but they did find the sort of evidence that might suggest alien life is down there on the surface of Titan, waiting to be found. It’s a little like walking up to a house and finding the front door open, and, inside, a T.V. stand that’s missing a T.V. It’s reasonable to assume the house might have been burglarized, but there are also other plausible explanations and you don’t have enough evidence to know one way or the other.